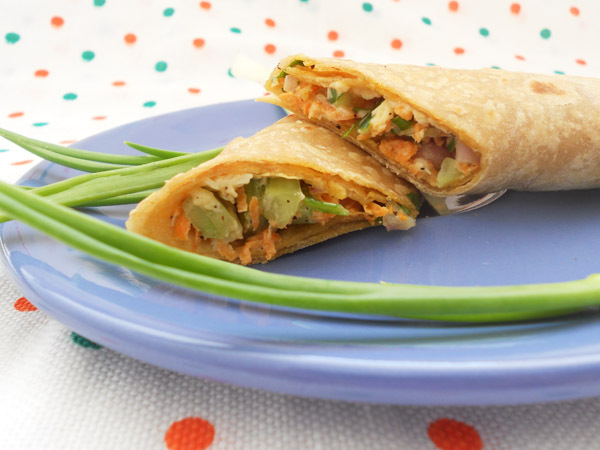 Whole Wheat Salad Wrap Recipe...step by step. Salad wraps are lifesavers for me, stuffed with lots of vegetables....wrapped in whole wheat roti/flat bread....I call it a distant cousin of Shawarma roll. 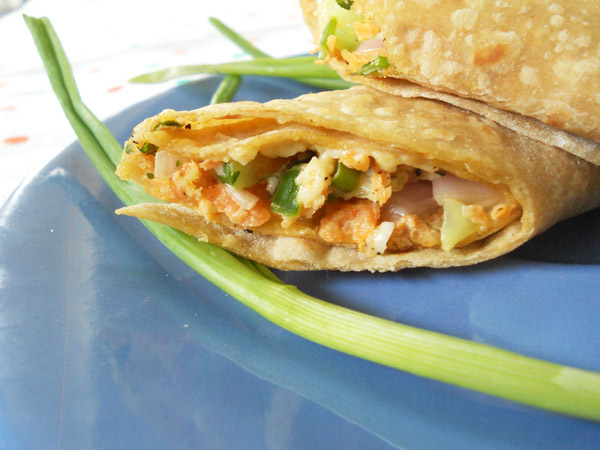 Adding cooked chicken makes it; Chicken salad wraps. 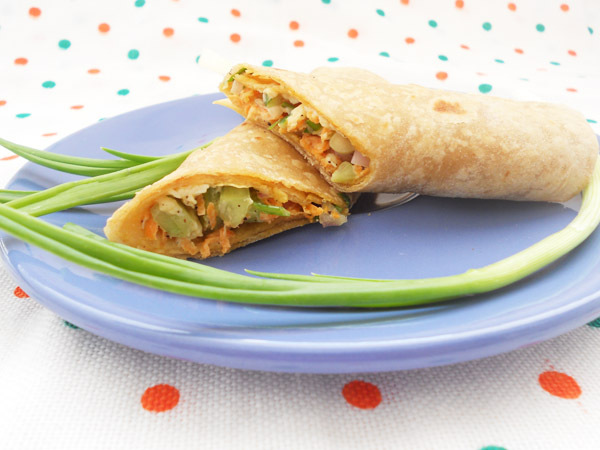 My son is a bit hesitant around vegetables, but if I throw in a bit of cooked chicken in the wraps...he is happy....and even claims amma's chicken wraps are the BEST....well, he is a mamma's boy! 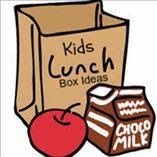 I had a few requests for kids meal....tiffin/lunch box meal, and so I thought today, I will share my favorite kids meal. This is perfect to get all those vegetables into your kids diet. 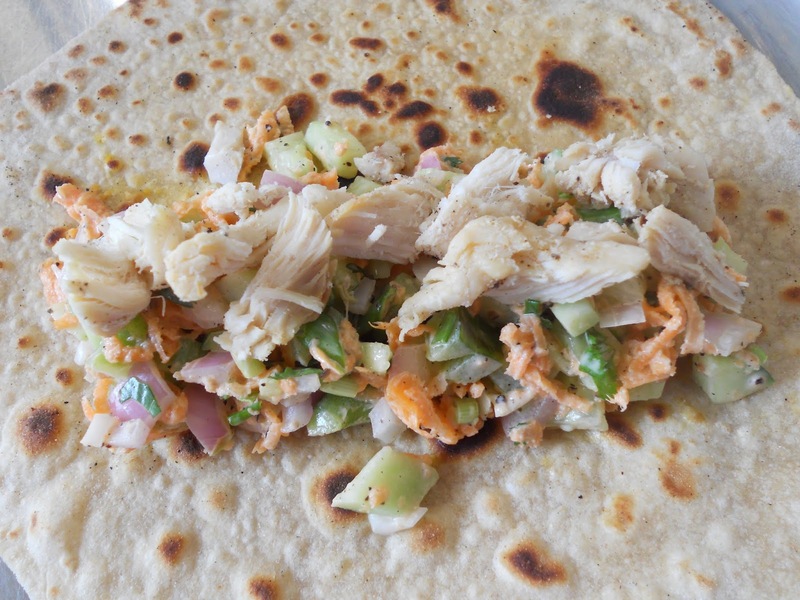 My daughter always says that, the taste is almost similar to shawarma (a middle eastern wrap), it might be because of the light garlic flavor. I always try to make the wraps as skinny as possible, that means less mayo, less cheese and mostly I omit the chicken (that is only to bribe my son). The friend who gave me the recipe, used to add about 1/2 cup of mayo and tons of cheese, but I have reduced these two to the bare minimum...so weight watchers adults, bachelors this one is for you too. I use whole wheat roti as the wrap, fresh roti, leftover roti or even precooked roti is fine. 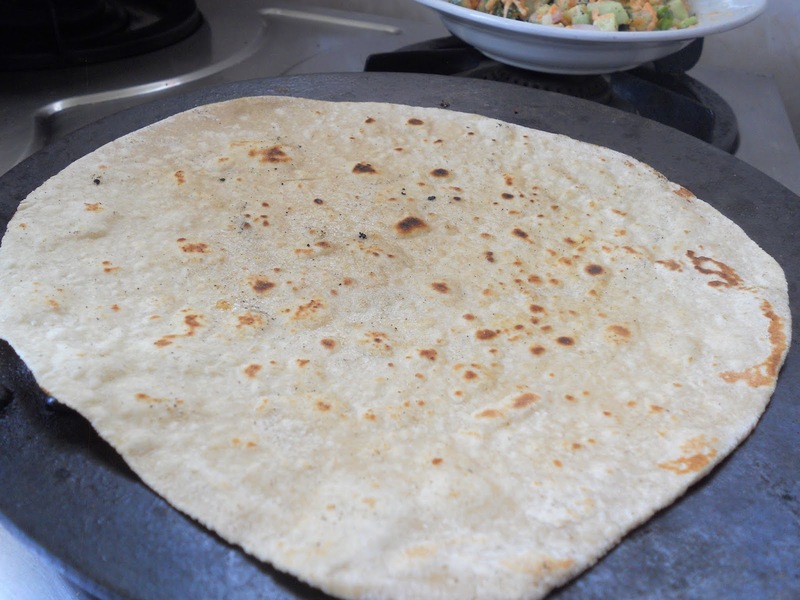 Using tortilla is fine, but I want to stick to whole wheat roti because that is always available in Indian homes. You can add most of the veggies. Stick to 1 tbsp of mayo and very little sprinkle of cheese if you are on a diet. Can add mozzarella, cheddar or any other cheese of your choice. 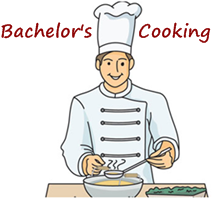 Can add boiled or cooked shredded chicken, preferably chicken breasts. 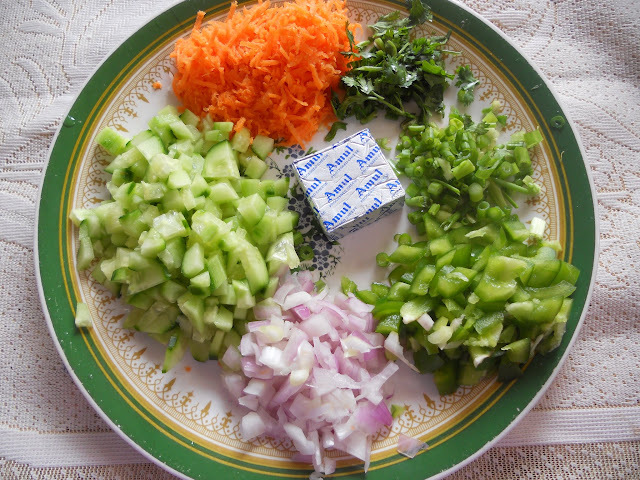 Can chop the vegetables and refrigerate it for later use. 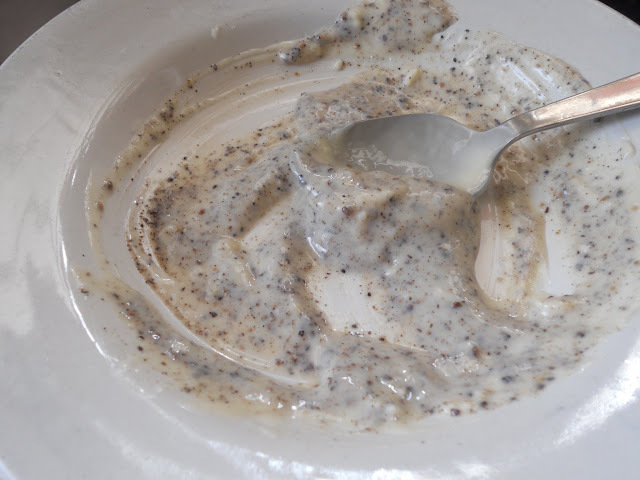 The original recipe called for garlic sauce, so to make it garlicky, I grate 3 cloves of garlic to the mayo. If you are packing it as a meal/lunch, I would suggest you to roll it in a foil paper, so that it stays fresh and warm. Green onion: 2 sprigs, chipped. Cilantro/Coriander leaves: 2 sprigs, chopped. Amul cheese: I used 1 cube (can add more cheese of your preferred taste and brand). Chop the vegetables except carrots, they are to be grated. (you can also add tomatoes, lettuce, celery, red & yellow peppers etc). Mix 1 tbsp of mayo, 3 garlic cloves grated, 1 tsp pepper, and lime juice. Mix the vegetables.....truck load of vegetables ...they are going into to your kids diet. Since I used precooked roti, I lightly heated it on a tawa...and the bigger the roti the better. And yes I prefer a hot roti......so that the cheese melts. 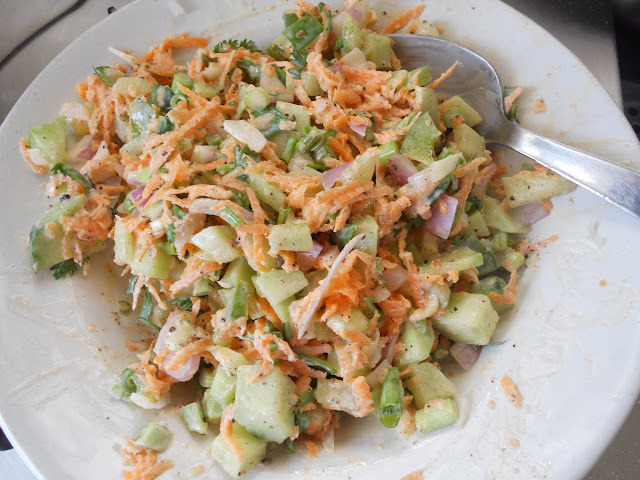 Place 2 to 3 tbsp of veggie mayo mix on to the roti. 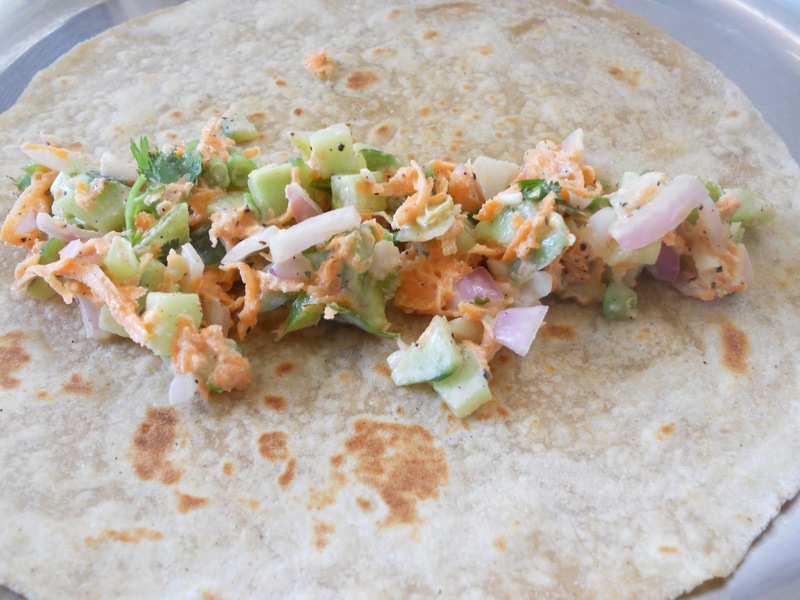 If you are making chicken salad wraps, sprinkle a bit of cooked chicken on top....even left over butter chicken shredded will be great....I do this to bribe my son. Then sprinkle with grated cheese....can also use cheese slices..just shred them. Now the best part....just roll it....the heat of the roti will make the cheese melt....and gooey. Salad wraps are ready.....so easy! I will be making this. It looks so good and I love roti. Creole Contessa-Thank u Lisa for the visit. 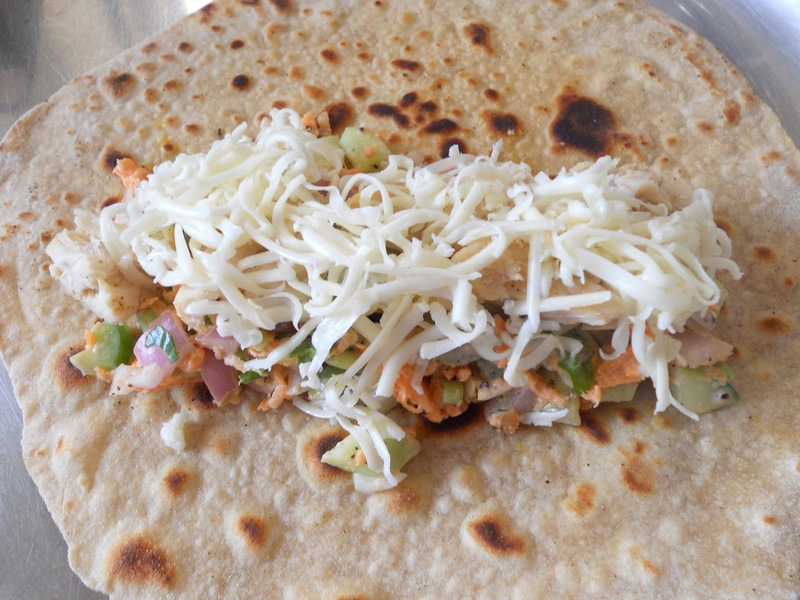 I am sure you will love this roti wrap. These would be great for the breakfast too! Angie-Ya you are so right..these would be great for breakfast.. Healthy and nutritious meal option. Love your clicks. yummy wraps. i also have nice wrap dish at my blog, do check it out. Looks yummy...Wraps are my daughter's fav. So i keep trying different varieties. This will be in my to-do list. Thanks Nisa. wwow thats one super roll now!! 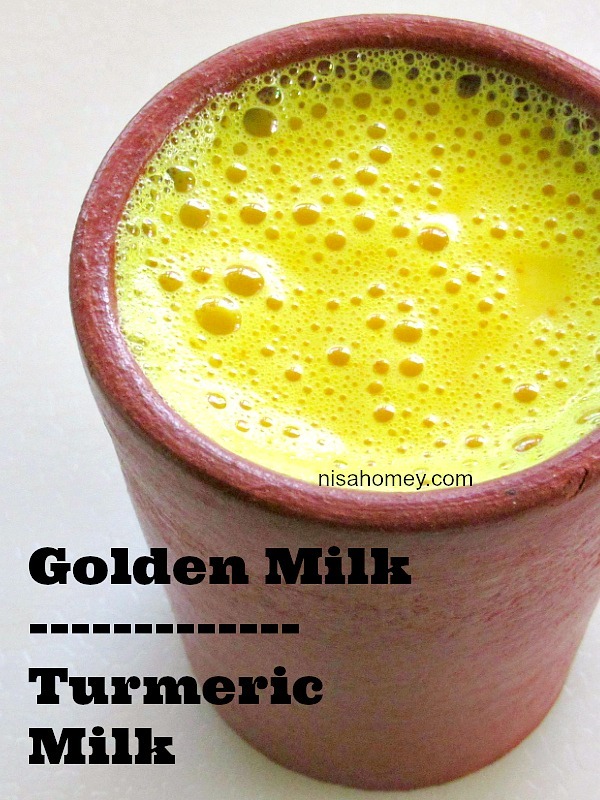 Nisa this is a delicious recipe. I always get such wonderful ideas from your blog! I'v tried this filling with chapathi and bread. 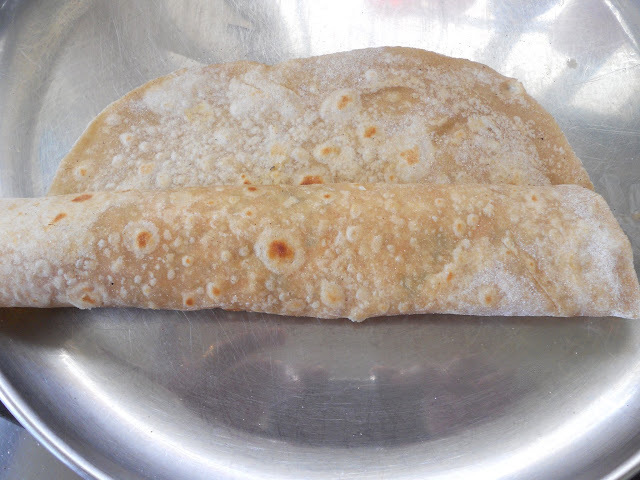 With chapathi it came out well... with bread, i've grilled it in a toaster..But the taste changed. Why is it so? Is it because i've grilled it for long? Indu, it taste nice to serve with roti or tortilla or even kubbus....if using in sandwich; i would suggest you not to grill it.